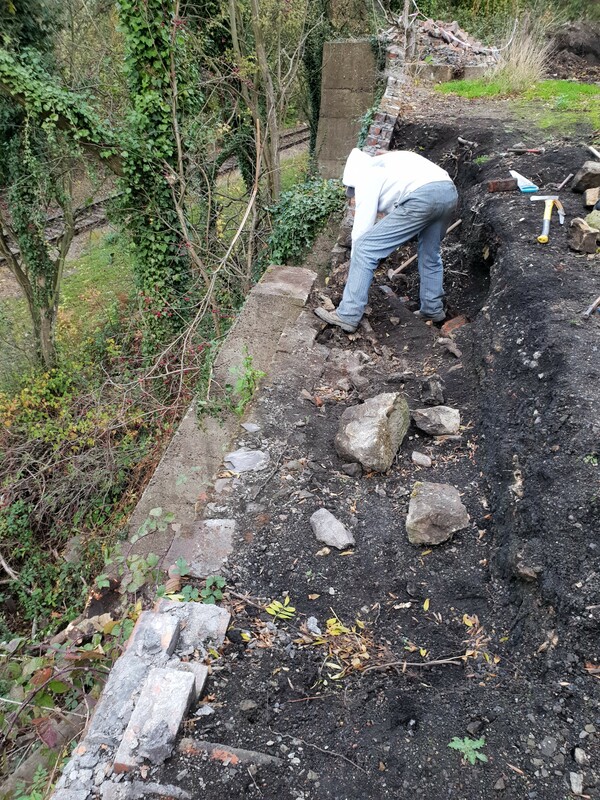 Notching up November On Saturday morning the Friends of Hemingfield Colliery returned to work on another open day. The approach of winter hardens the ground and turns the air, so working out doors becomes harder and the days slightly shorter as the clocks fell back at the end of October. 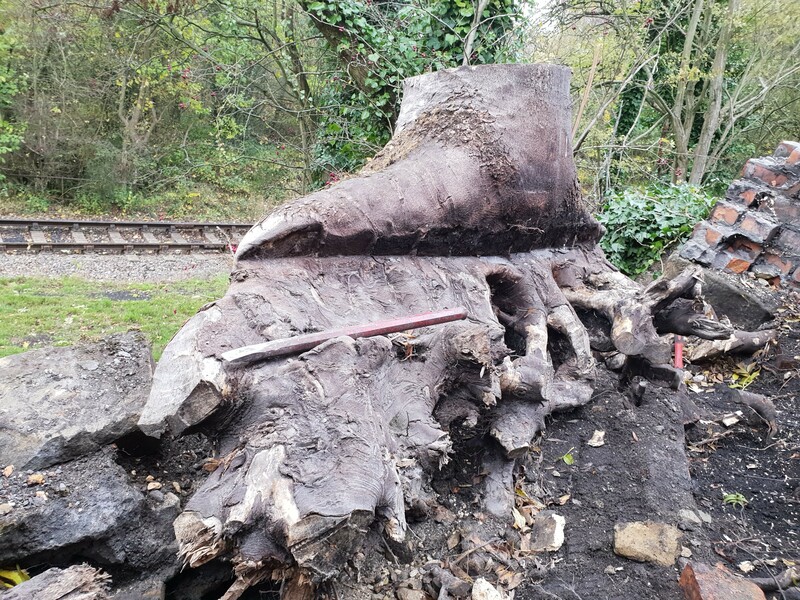 With the great sleep-in behind us, the Friends and regular volunteers were eager to face the ultimate challenge: shifting the Great Stump. The Axemen cometh (again) Friends Chair Steve and regular volunteer John were first on site, joined a little later by a well-wrapped Chris. 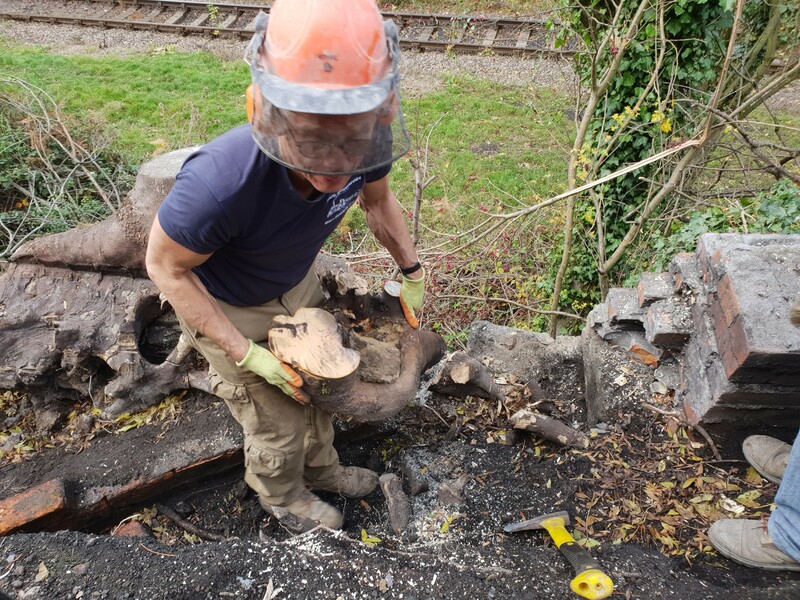 Heading straight for the lower terrace, the crew returned to the scene of previous struggles with the huge tree stump which had self-seeded atop one of the concrete buttresses of the retaining wall. Having rooted under the existing boundary wall, the curious tree retains the mortar-marks of a slow but steady war of wood-on-brick. 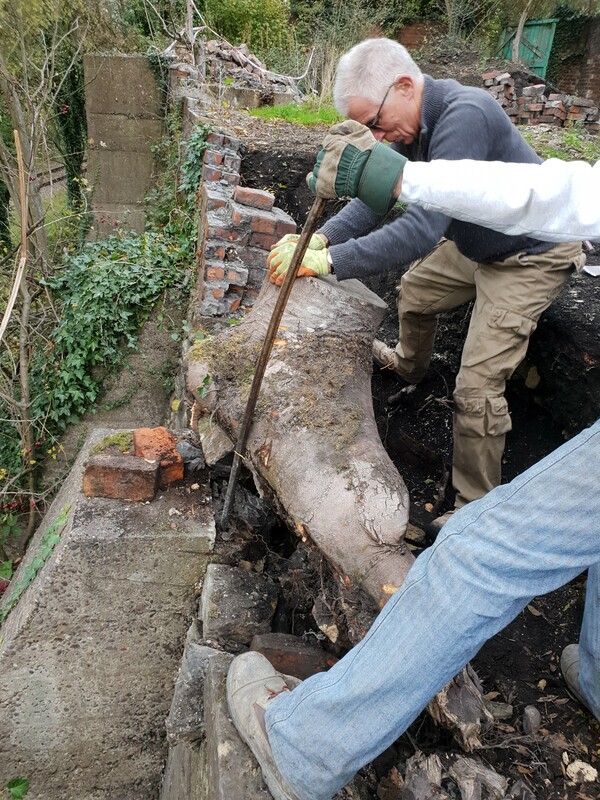 Only by removing the remaining damaged wall, and lifting the stonework enveloped by the tree could the Friends begin to repair much of the damage done to the lower boundary. This week everyone was determined to get the job done. 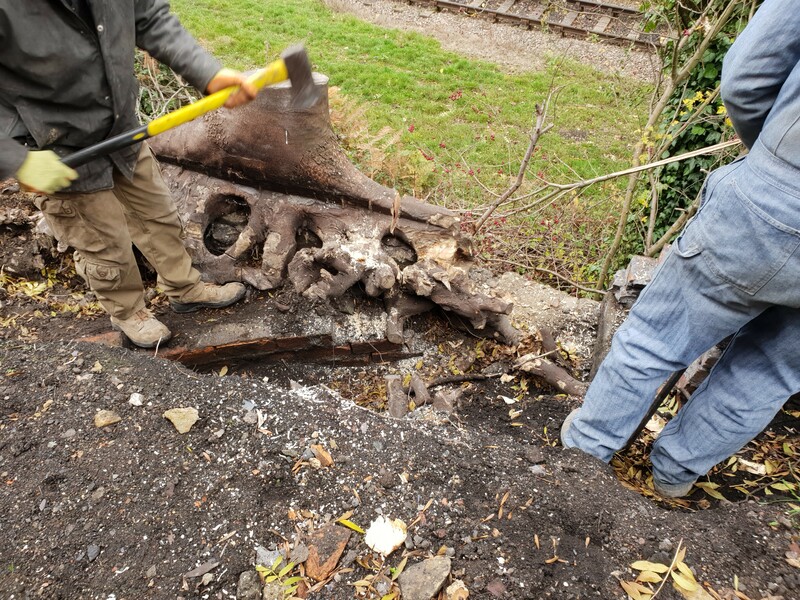 With chainshaw, handsaw, hatchet, hammers, chisels and pry-bars galore the light infantry moved in and started chipping away at the remaining roots holding the beast in place. After some verbal encouragement and additional sawing, the first hunk anchoring the stump down was shifted. With it came shattered stonework as the trees roots had gripped onto bricks and masonry over perhaps 50 years or more. Unlike dental surgery, this style of root canal made for a strangely beautiful sight. There were, alas, no points for style, or compliments on technique; no honours for synchronised sawing or plaudits for acrobatic axework. Onwards, ever onwards. With some sharp-eyed root removal (imagine three-dimensional chess moves) and sweet-talking, it moved. A bit. Just a tiny bit, but movement was the chink in the armour. 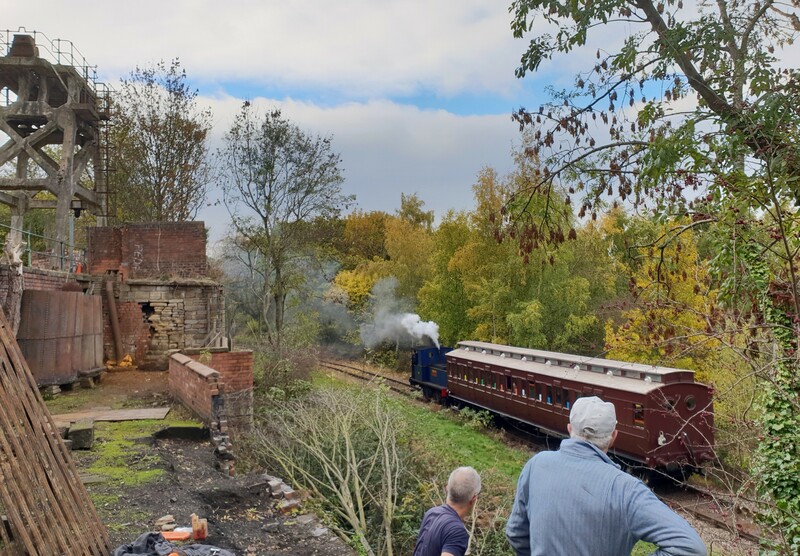 A wedge or two later and the whiff of victory, the suggestions of success was in the air, that and steam from Elsecar Heritage Railway passing by below (more of which anon). Wedges in, the rocking and rolling began. The annals of Hemingfield Colliery will no doubt long remember the moment when the Mighty Stump fell. Recorded for posterity. And it’s gone! The buttress bared, and a whole lot of wall to repair, but with stacks of stone and bricks carefully stored ready for reuse and repairing. It was quite an epic battle! Remembrance – Home from the Front November is synonymous with cold; with frosty dull dreary greyness. Not this one. Bright blue streaks of sky, and trees still heavy with leaves, discoloured but not yet fallen; the scene was full of contrasts. Pit, railway, wood, fields beyond and the water down by the canal. Birds in the sky and the unmistakeable sounds of a locomotive passing beneath the working party at the pit. What a pretty sight, in the shadow of the headgear. 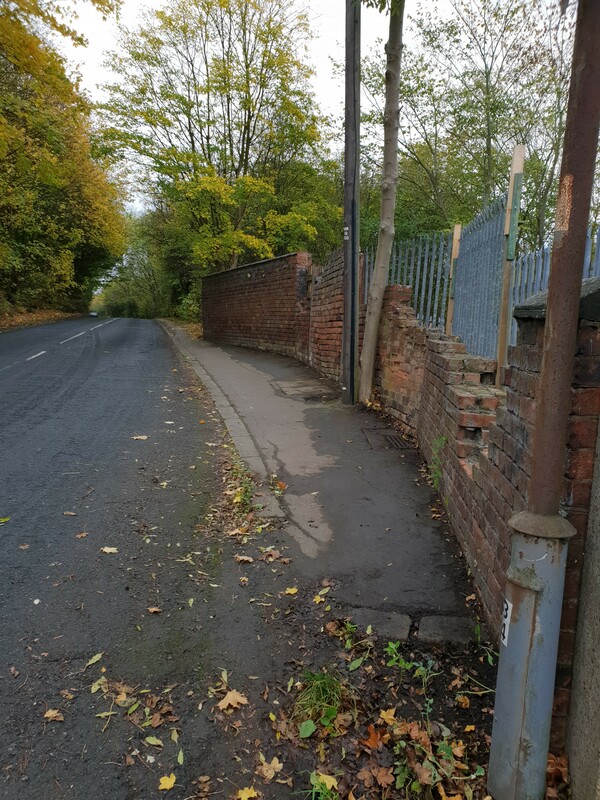 Earlier in the morning volunteers has set off from Elsecar Heritage Centre to litter pick their way towards Hemingfield. 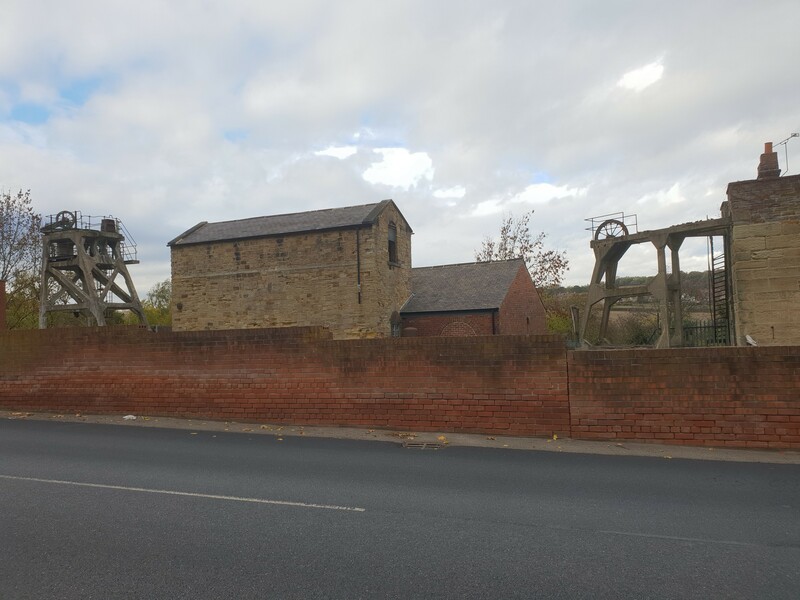 Caring for Elsecar and making a difference to keeping its surroundings tidy. It’s heartening to have a community of people that really do care. Admiring the train passing by, the Friends also looked on and considered the special passengers it contained – the living history performers of Home from the Front – bringing to life the stories of real local people returning home from the First World War. Providing a powerful echo of the demobilisation of men from 1918-20, our friends at Elsecar Heritage Railway, together with support from Great Place Wentworth and Elsecar, and students from Barnsley College and University Centre Barnsley, provided a unique journey on a train specially prepared for this centenary of the First World War. Leaf, no trace Autumn brings its wonderful colours, but also its natural clutter; leaves gather on the road to the pit. It’s a pleasure to keep things tidy and presentable. A quick before and after tells the tale of the advancing season. The stump cleared, a fine luncheon to reflect on progress, and the site tidied up, the day’s work was done, and the Friends departed ready for the next phase of works on site, pausing only to remember the lives of the workers of a hundred years ago; their families and friends affected by a conflict which changed forever the local community, both those who returned and especially the loss of those who never came back. Leaving Pit Row behind, we stopped by the poppies of two sons of the Guest family. We will remember them.